The obviously highlight of the entire Hunger Games film series are the hunger games themselves. The immoral concept that children and teens are forced to battle each other to the death in a purposely controlled and dangerous environment for the entertainment of a disgustingly corrupt and malicious government and its richest people makes for fascinating discussion-worthy cinematic entertainment. Unfortunately, the hunger games went out the window at the end of the second film as the rebellion started in full swing. 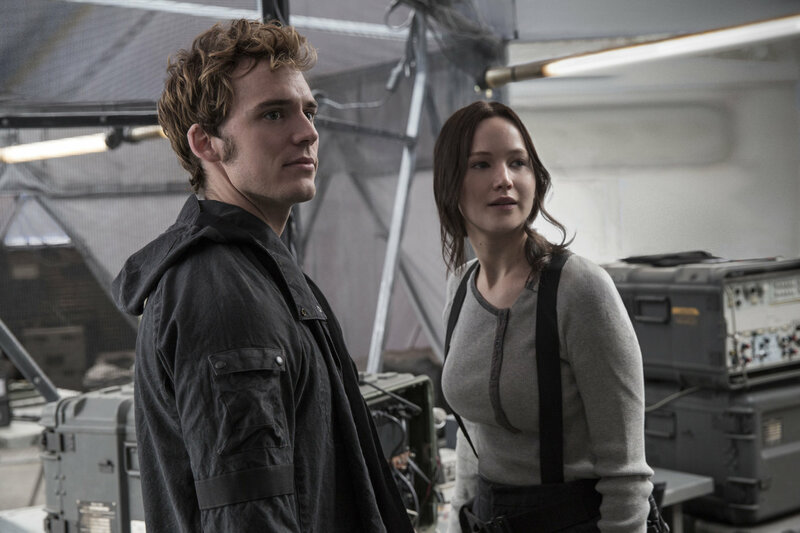 You get the sense that the rebellion is what author Suzanne Collins was getting at all along – this is a series that is about so much more than children being forced to kill each other. It’s also thankfully about much more than a girl having to choose between two guys, though it’s about that too. The hunger games themselves is what I personally find so fascinating about this series; the rebellion is the next logical step, yet far from the story’s most interesting ideas. Part 2 picks up literally right where the last film left off with Peeta (Josh Hutcherson) locked up and completely brainwashed. Katniss (Jennifer Lawrence, looking somewhat bored as if she could play the role in her sleep by now) and her fellow rebellious members of District 13 are ready to finally make their move to the capital to dethrone the evil President Snow (Donald Sutherland). We finally get to see two of my favorite characters get the screen time they deserve including Johanna (Jena Malone) freshly rescued from the Capital and Finnick (Sam Claflin) who gets married before setting out for battle. Effie and Haymitch around too but seem underutilized. This film feels much like a war film with a small group of soldiers making their way across the booby-trapped rubble of the Capital. These scenes, reminiscent of the traps set by the hunger games’ sadistic gamemakers, are the definitely highlight of the film and feature some pretty successful sequences including an Aliens-like venture into the dark, pipe-riddled sewers of the Capital. Director Francis Lawrence doesn’t deviate much from the style he inherited yet made his own when he took the reins on the second film. And the film’s screenplay is thankfully less talky and way more action heavy than Part 1. Trailer for The Hunger Games: Mockingjay - Part 2 on TrailerAddict.